In a number of countries mandatory helmet laws have been introduced for children, and there is frequently pressure for new laws. At first sight this may seem a beneficial policy to protect vulnerable cyclists, but there are many reasons why such a measure may cause more harm to children than the problem it seeks to address. This case study examines the evidence on the wider consequences of a child helmet law. Based on a paper produced originally with a UK focus, its content is equally applicable to any country. The principal threats to children's lives at the beginning of the 21st century are obesity, heart disease and other illnesses resulting in large part from inactivity. Cycling has a key role to play in preventing these illnesses. Less cycling through a helmet law would aggravate an already very serious situation. In the UK, 16% of 6 to 15 year old children were obese in 2001 - up from 5% in 1990 (RCP, 2004). This amounts to over 1.2 million children (ONS, 1). 9% of 2 to 4 year old UK children were already obese in 1998 - up from 5% in 1989 (RCP, 2004). This amounts to over 300,000 children (ONS, 1). Predictions suggest that 1/5th of boys and 1/3rd of girls (3 million children in UK) will be obese by the year 2020 (RCP, 2004). Being overweight restricts body activity, damages health and shortens life; and it harms self-esteem and social life. Heart disease, stroke, joint problems and the commonest form of diabetes (Type 2) are direct effects of obesity and overweight. People of every age, every region and from all population groups are affected. Overweight and obesity also result in a huge financial burden for government, the NHS and society as a whole - the National Audit Office estimates costs to the NHS of at least £0.5 billion a year, and £2 billion to the wider economy. Doctors and public health specialists are so concerned about the medical problems being stored up by overweight and obese people that they are campaigning Government for fundamental changes to life styles (RCP, 2004). Obesity shortens lives by an average of 9 years (PAC, 2002). In the UK, 157,000 people die of heart disease each year, over one-third due to inactivity (ONS). Children as young as six now have the early signs of heart disease (UWA, 2004). Cycling gives a level of fitness equivalent to being 10 years younger (Tuxworth, Nevill, White and Jenkins, 1986) and a life expectancy 2 years above the average (Paffenbarger, Hyde, Wing and Hsieh, 1986). The health benefits of cycling far outweigh any risks involved (BMA, 1992), by a factor of around 20:1 according to one estimate (Hillman, 2003b). People who cycle regularly live longer than non-cyclists, with a 29% lower mortality rate and better health throughout their lives. Indeed, cycling regularly to work (and, by extension, to school) has been shown to be the most effective thing an individual can do to improve health and increase longevity (Andersen, Schnohr, Schroll and Hein, 2000). It takes over 3,000 years of on-road cycling to suffer a serious head injury, let alone one that might be mitigated by a cycle helmet (derived from NTS 1998-00 and Cook and Sheikh, 2000). In the UK, child cycling accidents account for only 7.1% of all child head injury admissions, and 2.4% of all child hospital admissions (Franklin and Chapman, 2005). As half of all children have bicycles, this puts risk when cycling into perspective. Cycling accidents are hardly more likely to result in head injury than the generality of child accidents. Even in collisions with vehicles, children suffer over 4 times as many head injuries as pedestrians than when cycling (Franklin and Chapman, 2005). In 2002, there were 2,183 child cyclist admissions with head injuries in England. 400 - 500 of these might be categorized as serious (i.e. fractures and intra-cranial injuries). However, it is unclear how many of these might be mitigated by a helmet, no matter how effective it might be (Franklin and Chapman, 2005). Child cyclist head injury rates in the UK have been falling at a rate that cannot be accounted for by helmet use. For example, they are falling in road crashes where TRL surveys indicate helmet use has decreased for those most at risk. The most effective way to reduce the likelihood of any kind of injury when cycling is to increase the number of people who cycle. When cycle use doubles, the risk of injury per cyclist falls by 35% to 40% (Jacobsen, 2003; Wardlaw, 2002; Leden, Garder and Pulkkinen, 2000). An international comparison shows that in those countries where cycle use is high, cycling is much safer yet very few people wear helmets (BHRF, 1079). 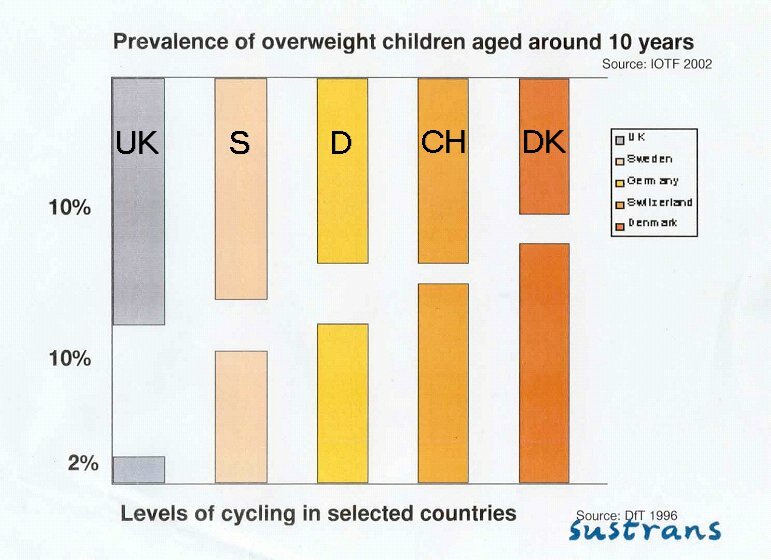 Moreover, the countries with highest cycle use (and low helmet wearing) also have the lowest levels of childhood obesity (BHRF, 1079). Helmet promotion is strongly linked to a decrease in cycle use (Bryan-Brown and Taylor, 1997), and helmet laws all the more so. Teenagers are the group most likely to be put off cycling. Helmet laws in Australia resulted in large decreases in the number of people cycling. Child cycling fell by 30% to 50% (BHRF, 1194). Cycling by secondary school children in Sydney was almost destroyed, falling by 91% (Smith and Milthorpe, 1993). A before-law survey showed that 272 out of 1,293 teenagers in Victoria (Australia) wore helmets. After the law, 302 wore helmets out of 670 teenage cyclists counted under comparable conditions (Robinson, 1996). The law resulted in 30 more teenagers wearing helmets compared with 623 fewer cycling. In Nova Scotia, Canada, cycle use fell by 40% to 60% following the introduction of a helmet law, with the largest decrease among teenagers (Chipman, 2002). In New Zealand, cycling decreased by approx 22% from the introduction of its helmet law in 1994 to 1997 (Perry). In Sweden, non-head injuries fell by 48% in helmet promotion areas compared with 32% elsewhere. The most plausible explanation is a substantial fall in cycle use (Ekman, Schelp, Welander and Svanstrom, 1997). In Britain, the fall in cycle use since 1991 has been almost twice the increase in helmet use (derived from DfT, 1 and Bryan-Brown and Christie, 2001). Senior neurosurgeons, cycling and helmet experts have consistently given evidence in British courts that cycle helmets have very limited value in cases of serious head injury. There is no large-population evidence from anywhere in the world that cycle helmets have been effective in reducing fatal or serious injuries. The British Government has said that it knows of no data linking increases in helmet use with improvements in cycling safety (Jamieson, 2003). Cyclists in the USA were 40% more likely to suffer head injury in 2001 than in 1991, although helmet use had increased from 18% to 50% (BHRF, 1028). In Greater London, cyclist injuries became more serious as helmet use increased in the mid 1990s. In 2001, although some 50% of cyclists wore helmets, the severity of injuries was higher than in 1981 and fatalities were at their highest since 1989. The severity of pedestrian injuries (which previously had tracked those of cyclists) continued to decline (TfL/TRL). In Great Britain, the rise in helmet use has not been matched by any detectable improvement in trends for fatalities or serious injuries (BHRF, 1236). In Nova Scotia, a law increased helmet use from 36% to 86%, but the fall in head injuries was only in line with the drop in cycle use 24. 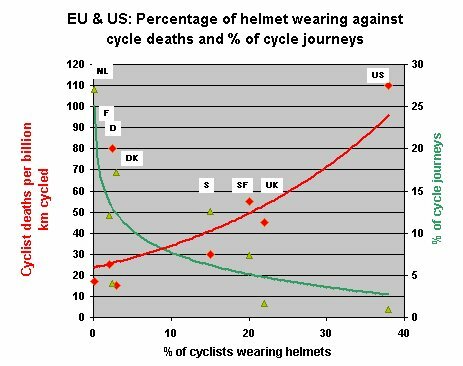 In Canada as a whole, rising helmet use (to 50% by 1997) has had no detectable impact on cyclist fatalities (Burdett, Can). In Western Australia, helmet laws caused head injuries to fall by 11 to 21%. But cycle use fell by 30% or more. The risk of head injury for those who continued to cycle increased (Hendrie, Legge, Rosman and Kirov, 1999). In New Zealand, large increases in helmet use have not brought about any reduction in the proportion of serious head injuries. Some reduction in mild concussions and lacerations has been balanced by an increase in potentially more serious neck injuries (Scuffham, Alsop, Cryer and Langley, 2000). Children are much more likely to suffer head injury as pedestrians, or through jumping or falling (O'Rourke, Costello, Yelland and Stuart, 1987), than when cycling. 6 times more pedestrians and 18 times more motor vehicle occupants suffer lethal head injuries than cyclists (Kennedy, 1996). Helmets for car occupants, including children, are more effective than those for cyclists and have greater potential for reducing injury (McLean et al, 1998). It would be perverse to prosecute children or their parents for cycling, which is beneficial to health, whilst encouraging through the same helmet law sedentary lifestyles, which lead to worse health and greater costs for society. In Australia, the courts rapidly became overloaded with the prosecution of those who had not paid their fines. The Victorian Children's Court pleaded to the police to reduce the number of helmet fines being issued (The Age, 1993). On other occasions children faced detention for up to 3 months, tearing families apart (SMH, 1997). are disproportionate to the risk of head injury when cycling. reduce cycling much more than they increase helmet use. threaten the lives and well-being of thousands of children by discouraging a healthy activity. aggravate efforts to encourage more people to lead active lifestyles. represent poor value for money. The laws in Australia and New Zealand failed subsequent cost-benefit analyses (Taylor and Scuffham, 2002; Hendrie, Legge, Rosman and Kirov, 1999). 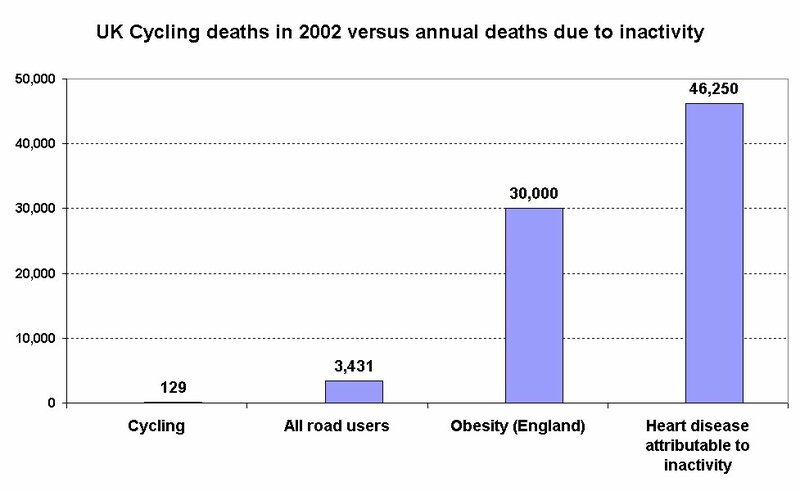 Helmet use, safety and obesity. .
Change in cycle use in Australia. .
Trends in cyclist casualties in Britain with increasing helmet use. .
Bryan-Brown K, Christie N, 2001. Cycle helmet wearing in 1999. Transport Research Laboratory Report 487. Cook A, Sheikh A, 2000. Trends in serious head injuries among cyclists in England: analysis of routinely collected data. BMJ 2000;321:1055. Traffic Census Data. Department for Transport. Ekman R, Schelp L, Welander G, Svanstrom L, 1997. Can a combination of local, regional and national information substantially increase bicycle-helmet wearing and reduce injuries? Experiences from Sweden. Accident Analysis & Prevention 1997 May;29(3):321-8. Hillman M, 1993. Cycling and the promotion of health. Policy Studies 14 (2), pp.49-58. Letter from David Jamieson MP, Minister Department for Transport, to Michael Jack MP, October 2003. .
Leden L, Garder P, Pulkkinen U, 2000. An expert judgment model applied to estimating the safety effect of a bicycle facility. Accident Analysis & Prevention 2000 Jul;32(4):589-99. National Travel Survey, 1998 - 2000. National Statistics. O'Rourke NA, Costello F, Yelland JDN, Stuart GG, 1987. Head injuries to children riding bicycles. Medical Journal of Australia 1987;146:619-621. Office for National Statistics. .
Population data from Office for National Statistics. .
House of Commons Public Accounts Committee report. January 2002. Paffenbarger RS, Hyde RT, Wing AL, Hsieh CC, 1986. Physical activity, all-cause mortality, and longevity of college alumni. New England Journal of Medicine 1986;314:605-613. Perry N, . Analysis of data from New Zealand Household Travel Survey. .
Storing up problems - The medical case for a slimmer nation. Royal College of Physicians ISBN: 9781860162008 .2004. Scuffham P, Alsop J, Cryer C, Langley JD, 2000. Head injuries to bicyclists and the New Zealand bicycle helmet law. Accident Analysis and Prevention 2000 Jul;32(4):565-73. Boy faces detention for unpaid bike fines. Sydney Morning Herald, 12th December 1997. Smith NC, Milthorpe MW, 1993. An Observational Survey of Law Compliance and Helmet Wearing by Bicyclists in New South Wales - 1993 (4th survey). NSW Roads & Traffic Authority ISBN 0-7305-9110-7. Taylor M, Scuffham P, 2002. New Zealand bicycle helmet law - do the costs outweigh the benefits?. Injury Prevention 2002;8:317-320. Traffic casualty statistics from Transport for London. Helmet wearing data from TRL. .
Focus on petty sins defeats court's purpose. The Age, 2nd September 1993. Tuxworth W, Nevill AM, White C, Jenkins C, 1986. Health, fitness, physical activity and morbidity of middle aged male factory workers. British Journal of Industrial Medicine 1986 Nov;43(11):733-53. University of Western Australia, March 2004. Reported ABC On-Line 4th March 2004. Wardlaw MJ, 2002. Assessing the actual risks faced by cyclists. Traffic Engineering + Control Dec 2002 p352-356.